As someone who is very passionate about the use of design projects to help others, I find it amazing that large-scale commercial projects can be about more than just functionality, but ongoing development as well. As a mother, I know there is nothing more transformative and pivotal in life than childhood, and even more so, childhoods affected by cancer. Children’s health and development do not simply have to focus on the physical, but the emotional and mental as well. Prinses Maxima’s collaboration with MMEK’ provides children this important experience of their growing years through ‘ABO areas’, “intended for distraction, movement and meeting” and aimed at reducing stress and stimulating development, for patients that range from infants to 18 year-old youths. The new Prinses Máxima Centrum offers development-centred healthcare for the diagnosis and treatment of children and youth with (suspected) oncological disorders, showing them that their childhood does not have to be defined by their illness alone. 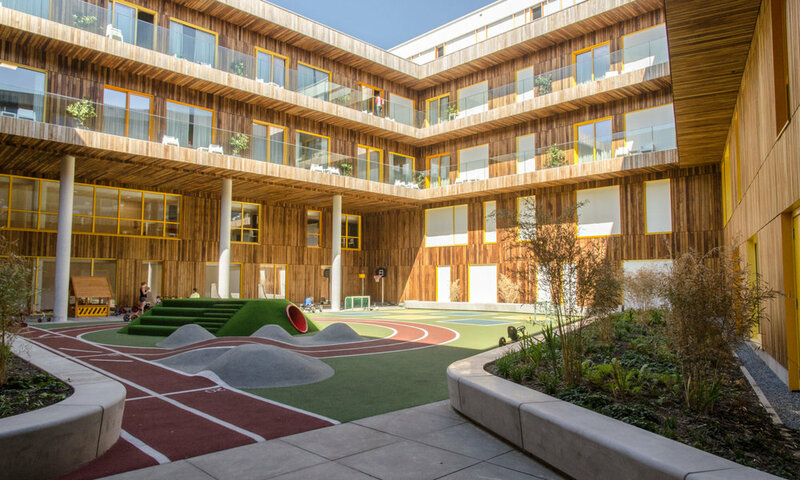 The new complex incorporates open, colourful spaces that encourages kids to be kids, instead of having to be confined in the ‘sterile’ experiences of a traditional hospital. MMEK’ underwent a reverse-design process, focusing on the needs of the patients and their families who unfortunately have to spend a lot of time in hospital settings due to their illness. MMEK’ also specialise in specifically in making spaces come alive through digital and spatial elements. This is clear in the collaborative design and architectural choices by MMEK’ and Prinses Maxima, ensuring that the ABO spaces are both safe and stimulating. The bright orange-and-white colour scheme of these spaces and the hallways that connect them has an open feel that encourages the children to explore, discover and socialise, instead of being confined in traditional hospital whites and dreaded clinical hallways. It challenges this traditional approach in medical design with the use of innovative furniture, splashes of colour and applications of IT that are not just designed for adults. The new layout includes a Discovery Corner that enables parents and their children learn more about the nature of cancer and cancer treatments. They also created The Park, a space meant for exercise and play, contributing further to the role of the environment in the development of children and youth as well as their recovery. There are playrooms and communal spaces for the younger and older children to interact in, giving them a hangout space as a way to make them feel less isolated. They transformed the traditional hospital layout into something more open and inviting for both patients and their parents alike, reimagining clinical detachedness into open spaces that encourage social interaction, bringing people together instead of keeping people apart, especially at such a vital stage in their lives.